My obsession with peanut butter runs deep. I can recall eating Skippy peanut butter right from the jar when I was pregnant (still not sure why my daughter hates PB to this day though?!) and I might have even topped it with Nutella! This is still probably my fav combo by far! I may be older and wiser with my PB and nut butter choices (seriously though, there were no other nut butter options but peanut butter just a few years ago!) but I am always looking for a way to incorporate more of it in my life! First, a few tips when choosing the best nut butter for your health. We have grown up Skippy and Peter Pan and not to knock them but we as a culture have so much more information right at our fingertips that it's impossible not to educate ourselves on what our healthier options are these days. Be sure to look for minimal ingredients such as just peanuts or almonds and organic when possible. If other ingredients are listed and you can pronounce them and know what they are then you should be good! 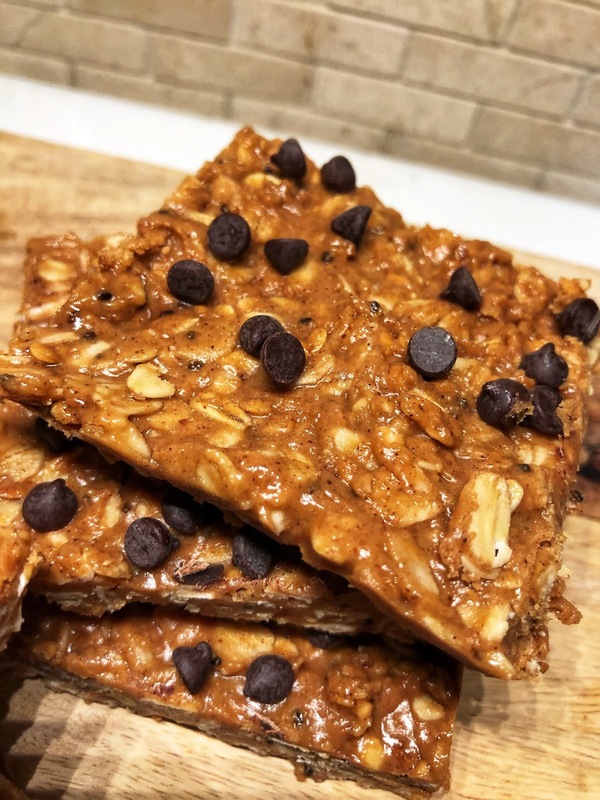 A few of my fav nut butters are Trader Joes almond butter, TJ nut butter (which has a combo of nuts, no peanuts), Georgia Grinders, Wild Friends and for this recipe I used TJ's peanut butter with flax & chia seeds. Great way to get added fiber and plant protein and it is so creamy and delish! Do you see the gooeyness above?! Along with the oats I added in honey for a touch a sweetness, cinnamon, and chocolate chips, because everything is better with chocolate, right? You can also try cacao nibs, crushed walnuts or coconut flakes too! For an added protein and collagen boost, 2 scoops of Vital Proteins Collagen Peptides went in as well. I love this stuff as it has no taste and my hair and nails have never grown so fast before! Did you know that by your mid-20's your collagen starts to decline and does not replenish?! The jury is still out on how effective these collagen powders are but for now, I'm on the collagen train! Back to the recipe, to put this tasty recipe together all you need to do is combine the PB (or whatever nut butter you choose), honey and coconut oil in a bowl and heat up until melted but not boiling. Then add in the remaining ingredients, press into an 8x8 pan and pop in the freezer for about 30 minutes. 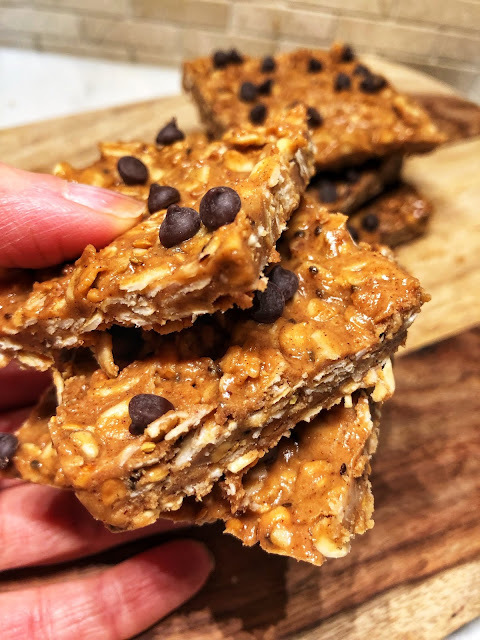 Cut them into bars and enjoy! I individually wrapped them so they were easy for grab and go. Plus I froze some to enjoy later! That's it! 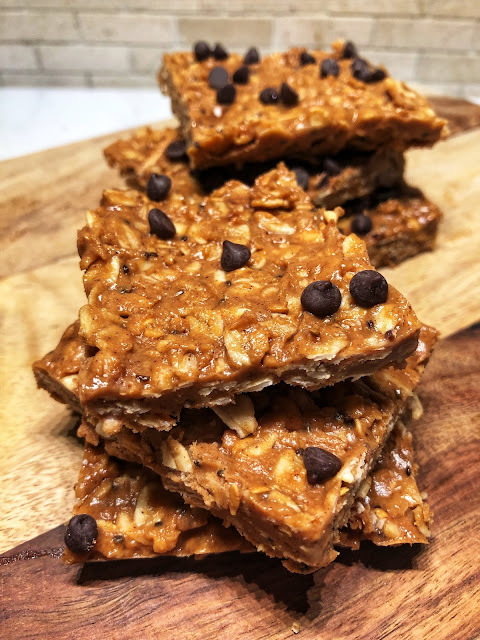 Another no bake no fuss protein snack. Way better than store bought! When you make these be sure to share with me on Instagram or Facebook! I love to see what you are up to! 1. Spray an 8x8 baking pan with nonstick spray or line with parchment paper. 2. Add the peanut butter, honey and coconut oil in a medium bowl. Heat up in the microwave in 20-second increments until melted but not boiling. 3. Add the remaining ingredients to the peanut butter mixture and mix until combined well. The chocolate chips may melt a bit but its just as good! 4. Press mixture down into pan evenly. Pop into the freezer for about 30 minutes or until firm. 5. Cut into squares and enjoy. I individually wrapped them in plastic and even froze some. Keep in the fridge as they will melt a little at room temperature.